After spending some time in St. Louis and taking pictures with the Gateway Arch like a good tourist, I had a hankering for some good food. By good food, I mean hot and spicy, and there is only one man I know in the area that can point me in the right direction. Scott Roberts is a well-known Chilehead and columnist that specializes in reviewing hot and spicy foods nationwide. So when it came time to find a place for good wings, Scott steered me to his hometown joint, St. Louis Wing Company. I was hoping it would turn out to be a restaurant with a bar, because after the day I had, I really needed a beer. So you can imagine my slight disappointment when I pulled up to find that it was more of a takeout type place. But good news was on the forefront as I got closer, because I noticed a dining area and a Budweiser sign in the window. With a sigh of relief I made my way to the nice girl at the counter, ordered up a Budweiser and a boat of their Traditional Hot wings. I felt like I was doing something wrong because they had such a wide variety of flavors and I was staying with the classic, but to be fair, that’s my favorite and the main focus for comparison. My 10 count of wings came out, and once the staff saw me break out the camera, it was all over. Suddenly I was forced to spill the beans as to why I was there, and once the cat was out of the bag, the spoiling started. “Sir, I would like you to try some of our new creations to see what you think,” or “This one is not on the menu, but we’re thinking about it… your thoughts.” I accepted all of the samples and then they left me alone to stare from the corner. The good thing was that it was nice and dark in the table area. Now, I don’t know if it’s to save on electricity or to give customers that intimate atmosphere to get all up close and personal with their wings, but it was nice to not have anymore of a spot light on me. I started with the Traditional Hot to ease my craving for that classic Buffalo taste. Both the size and the heat level were pretty average, but the flavor of the sauce had a bit more to offer than a bottled brand. That, in combination with a juicy chicken, made eating them easy and I kept going back again and again. The only problem was they lacked that spark that I look for in a great wing. 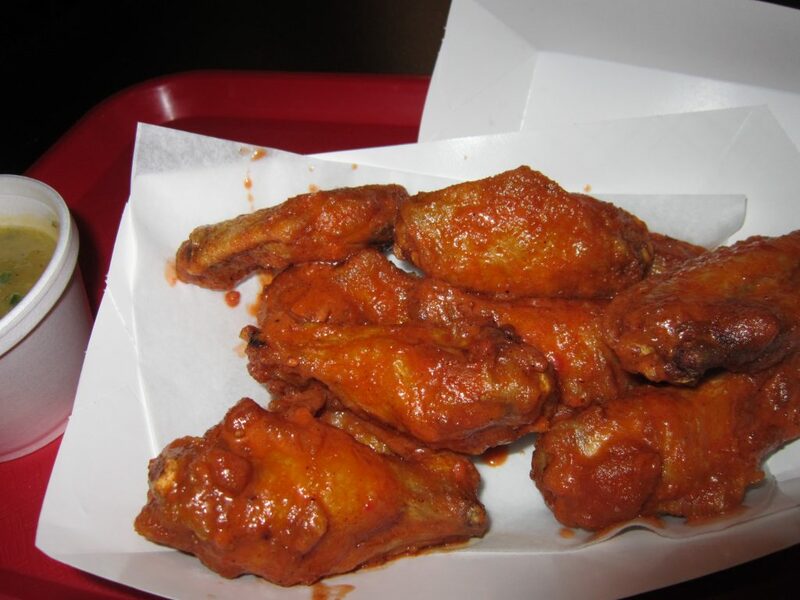 The spark that leaves you without a doubt in your mind how great wings can be. Maybe it’s because they have so many flavors and the others are taking away from the time spent perfecting the original. Or, maybe they thought it was perfected. Either way, one thing that was for sure was the care and time spent on the other sauces, and the only other thing I could think to do was indulge in some of these concoctions. Next up is the Rally Squirrel (named after that rowdy rodent that got all the attention at a local Cardinals game by running across home plate during a pitch). This wing was extremely sticky due to its caramelized sauce that included crushed peanuts as a coating. It was definitely a mixture that I wasn’t used to. I’ve had the Spicy Peanut wings at the Buffalo Wing Festival before, but nothing that added the crunch of real peanuts like this did. It was certainly unique. But it wasn’t the only one. Waiting for me in the next dish was a Spicy Strawberry wing that used actual jam mixed with the peppers. This was different than the pepper jelly wings, from Suzanne’s Kitchen, because the jam here was thinned out and acted more like a reduction sauce rather than the baked on coating we get from the other. Either way it was still my favorite oddity of the flavors, and I agree that it should join the others on the menu. Ultimately, Scott knows his stuff and I’m glad I took his advice. The selection and variety that the St. Louis Wing Company brings to the table is immense. And even though there are other joints that do the same, I have yet to find one that spends an equal amount of time to match the complex flavors of some of these sauces. My only advice would be to keep doing what you’re doing, but don’t put the classics on the back burner. The Traditional Hot was a good eat, but it still needs just as much attention as the rest of these culinary wonders to get it to the top.